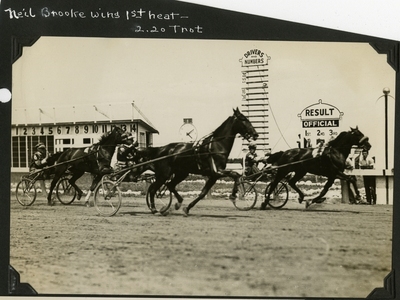 Sepia tone photo of bay gelding Worthy Heir (far left), D. Stokes up, finishing third in the first heat of the 2.20 Class trot at the Grand Circuit Meet, Rockingham Park, Salem N.H., August 1, 1932. The race track scoreboard, race clock, and finish line marker can be seen in the background of the photo. Other horses in the photo are Neil Brooke in first and Senator Volo in second.